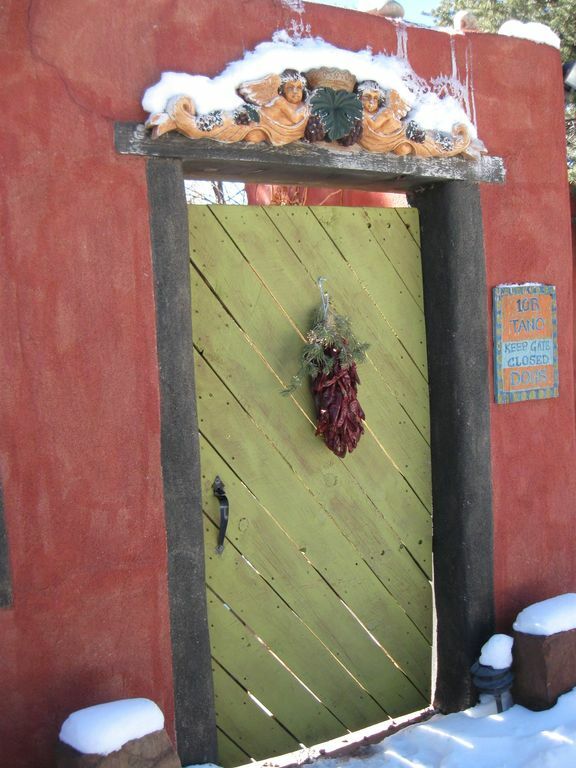 The Canyon Cottage has a separate bedroom and a full kitchen and a shared laundry. The Cottage is decorated with original painting by the owner also beautiful Mexican handmade tile in kitchen and bathroom. The ceilings are rustic beams and rough saw wood along with all hand made cabinets. The compound is located in Santa Fe's exclusive northern Pinon Hills;just minutes from the Opera and less than three miles from the historic downtown plaza.The property, designed by the owner/artist, reflects the adobe architecture so loved in this part of the world. Transport yourself to Old Santa Fe, with country privacy in the hills above town and watch the sunset and relax. The Canyon Cottage is rented by the week or month. Please contact owner for monthly off season rates. Bonnie is an Artists Designer and has made her home here in New Mexico for 25 years. She has been very interested in green building and alternative renewable energy for years and has incorporated this into the building. The property is surrounded with natural landscaping ( another hobby ). She is from Cincinnati and Northern Kentucky where she had a restaurant/Jazz Club foe 25 years. The property is a compound with a rental and a main house. Everything is separate and private. It is set in the hills just above town, in the city limits. The property has the feel of the country the pine trees. It is a beautiful piece of architecture so loved in this part of the world. In town and close to everything. _________________________________ The Canyon Cottage is perfect for a longer stay. Rented only by the week or month, the cottage has two lovely open rooms. The unit features a full kitchen with hand painted Mexican tiles, a dining area, living area and full bath featuring a soaking tub. The kitchen area steps out onto a portale with seating for outdoor dining or watching the sunset over the canyon. The separate bedroom features an office area, high ceilings, exposed painted beams and a queen size bed from which to enjoy the clean mountain air. *PRIVATE, secluded & safe *Close to Santa Fe with a rustic, country feel *Full kitchen w/ utensils *Queen size bed *Flat screen tv, radio/cd player *Wifi/Satellite TV with premium channels *Soaking tub *Covered portale with outdoor dining/lounging area and grill *Ceiling fans, screened windows, cool adobe style building with AC *Gorgeously decorated with Mexican style tiles and artwork throughout *Plenty of parking the unit shares washer/dryer *Wifi/ dish tv with premium channels *Ceiling fan ___________________________________________________________________________ We look forward to you staying with us! The week flew by too quickly - the Canyon Cottage was exactly what we were looking for on our 30th wedding anniversary. It was clean, quaint, and so Southwest - did we mention clean?! The cottage is decorated with beautiful artwork and oh, so cozy. The hospitality is exceptional from Bonnie, who greeted us as we arrived, right down to her sweet little four legged friends. This was a sweet and quiet spot - a little Oasis from the bustle of the main town of Santa Fe. It was very convenient to travel to areas around Santa Fe along with areas outside of Santa Fe - we are already planning our next visit! Can't wait! Thank you Bonnie and Deb! My husband and I spent 5 nights at this wonderful location and what a blessing it was! We totally agree with the prior written reviews for this place. Bonnie and Deb immediatley made us feel welcome providing us with a bottle of wine to start our vacation, suggestions on places to visit and great places to eat. Originally I had wanted to stay in town to be near the Plaza but I am so glad that it did not work out and we stayed in the Aspen Suite. This place is so beautiful, peaceful and welcoming, we watched hummingbirds, chipmunks and a rabbit all running around enjoying the land. The grounds are lovely with plenty of places to just sit and enjoy your surroundings. We were literally less than a 10 minute drive to the Plaza (parking is not a problem in town) and we were less than a 10 minute drive to the Opera House for which we had tickets (the opera was amazing). This was an amazing vacation and we too felt like we were leaving family as we drove away. Bonnie and Deb are two very special people that have the gift of helping and hospitality and I hope we get back there again for another visit. Please don't think twice about staying at their wonderful facilities if you are going to Santa Fe for a vacation, you will be so glad you did! Immediately on arriving we were greeted by Deb...welcoming us like old friends. Almost immediately after, came Bonnie, and she was bringing us a bottle of wine so that we could toast our arrival. And so began our stay at the Aspen Suite. The place is loaded with charm. Our beautiful room had a wall of windows with french doors that looked out onto the hills, past two lovely ponds and beautiful trees. It was decorated with Bonnie's beautiful art and her amazing sense of design. It was everything one could want. Adjoining the bedroom..through beautiful old doors.. was a spa bathroom, all done in mexican tile and sporting a large jetted tub under a stained glass window and a large steam room/shower. We were totally charmed! There is a little compact kitchenette that was great to have. Everything was so well thought out. A place to read, a place to relax..even a little patio outside beside the views. The accomodations are great but the very best part is getting to be cared for by Bonnie and Deb. We felt as if we were returning to the home of old friends. These two gals are just terrific. They are so kind and caring. I was sure it must have been karma that brought me to their door. When I had a cold they brought me tea and honey..when we were too tired to go out to eat, they offered us food for dinner. This place is a little miracle. Animal friendly, too! If your plans take you to Santa Fe, don't hesitate and make your home here....you will be glad you did. Thank you Bonnie and Deb...we will return, if for no other reason, to see you both again! Keep the light on for us! The Casita was wonderful! Clean, bright with everything that was needed was there in a perfect space for two and a dog. We spent more time in the outdoor patio than downtown Santa Fe watching the hummingbirds at the feeder. A great place to stay that made you immediately feel like it was your home. I will definitely be back again, thank you Bonnie!